Lost your way? Put on a little weight? Well, nobody is perfect and we all have days when we fall off the wagon and feel like giving up. Weekly body composition & measurement follow ups…. 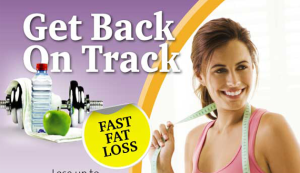 The Back on Track program is designed for someone who has been fit & needs to get back into the swing. It requires a commitment of 4-5 days in the gym with a 2 two week training workouts which will whip you into shape & lose fat quickly in 4 weeks. You will be trained on how to perform all the exercises before you start. It is a wonderful program if you are serious about getting fit fast 🙂 We look forward to hearing from you soon. Please visit us at In Shape or go to http://www.inshapeme.com and DOWNLOAD OUR FREE 7 DAY VOUCHER ! Looking for 4 week course and wanted to shape my body completely because too much muscle in my body.. kindly email me ur price and course details. This program will cost you aed 1800! It includes a one month membership / 4 Personal training sessions / 2 gym workouts / an initial consultation and 2 follow ups!! !